With the demand for quality graphic designers come the surplus of amazing programs for those who want to learn more about the industry. 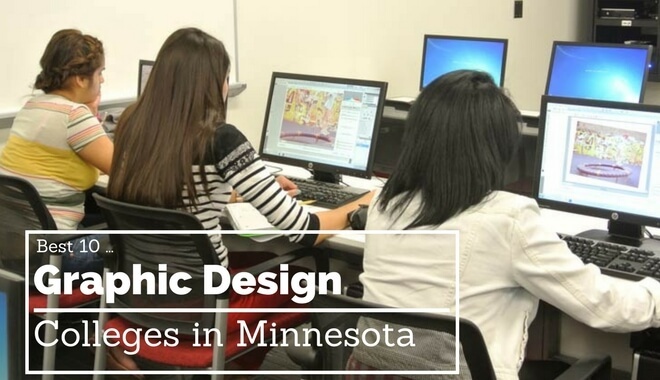 In this article, we compiled the leading institutions in Minnesota that offer a graphic design degree or certificate. Take your pick among the following universities and college and decide which one is for you according to your budget, desired career path, and skills. Augsburg University’s Graphic Design program is based on a curriculum designed around interdisciplinary teaching, combining problem-solving and design thinking through its experiential design studio approach. With collaboration with other disciplines within the University and with international and local partners, Augsburg University’s Graphic Design program is structured to maximize its liberal arts degree. Bethany Lutheran College’s Graphic Design program helps those who are seeking careers in design and art by providing them with a broad and holistic foundation of liberal arts. Students are made familiar with the practices of a design-focused career and are taught to become lifelong learners in the field of design. Bethany Lutheran College aims to produce students who can develop their vocation in graphic design, adding service and value to others. The Bachelor of Arts in Graphic Design offered at Bethel University aims to combine studio arts experiences with the disciplined practices of business, communication, and the social sciences. Students in this course are actively challenged to understand their roles in the graphic design industry and how it can be applied to practical applications of their careers. The Bachelor of Arts in Graphic Design at Concordia University involves the study of fundamental graphic design with a focus on digital art making. They help their students answer the questions surrounding design and technology, color theory and advertising, developing their personal voice, and more. The Graphic Design program at the Minneapolis College of Art and Design teaches students to combine form, image, and type to create captivating visual information and design. With this program, students can expect to develop their own voice with a focus on producing original work, research with innovative content and concepts, learn to communicate their ideas visually, and prepare for a vocation in graphic design. The Graphic Design program at Minnesota State University—Moorhead utilizes both traditional and computer processes to help students achieve effective visual communication solutions through conceptual and technical applications. With this program, students can expect to deal with various systems, including symbols, visual concepts, information design, motions graphic, web design, brand identity, visual research, and more. Studying Graphic Design at St. Cloud State University helps students to develop skills in visual communication through images, typography, and other mediums. You will learn to understand communication and design solutions for modern problems. The graphic design program actively incorporates technology in its lessons, with thorough explorations in web, print, and interactive design practices. Students may also expect to learn contemporary methods in graphic design alongside foundational understanding to the industry. Digital Graphic Design majors at Saint Mary’s University is aimed towards students who are seeking to begin a career in graphic design, motion design, visual communications, web design, publishing, and similar fields. Students are taught how to communicate successfully and effectively through visual mediums. A digital graphic design major can expect to learn about typography, motion design, web design, illustration, photo processes, and work with programs such as Photoshop, Acrobat, InDesign, Dreamweaver, and more. University of Minnesota–Twin Cities prides itself on offering one of the most compressive design programs in the country, with the College of Design known as a recognized leader in transformative thinking and practicing. The graphic design program specifically helps students understand design methods and theory while utilizing problem-solving abilities to solve real problems in today’s industries. The graphic design program at University of Northwestern–St. Paul is unique in that it offers both a BA and a BS in Graphic Design. This program provides basic and advanced education in the technology, techniques, and strategies involved in the field of design. Students can expect to learn skills in advertising, computer graphics, education, freelance design, graphic arts, illustration, website design, and more.